Caught this nice fingermark snapper last nite. It took the bait and the line when slack. I caught another marine catfish later with a cocktail bait of tamban n cut squid. Total of four fishes were caught by my friends last nite…All are on fresh squid bait with a long snood bottom feeder rig. 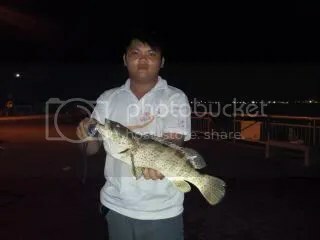 First one was a 1.2kg grouper by SF around near to 7pm when the sky about to turn dark. His Penn slammer pair with a Shimano TLD star alarm sounded. He go to strike and wind in this nice grouper…I took his squid net to scoop it up. Around 8pm plus…Ah An Century Vectra rod pair with his Shimano Torium 30 alarm sounded. 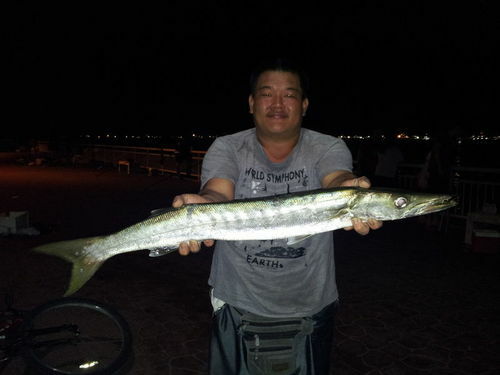 He strike and a fish jump out of water surface…easily he wind in a 2.5kg barracuda(Top photo). I used my hand to grab his leader and haul it up the jetty.